Mobile Al is a party town with events ranging from the annual Mardi Gras celebration and Senior Bowl to monthly events such as LODA Artwalk, its only natural that this town also has a lot of party rentals. When you are talking about party rentals, this includes everything from tent rental, and furniture rental to cotton candy machine rental and snow cone machine rental. Tent rental in Mobile and Baldwin county is common for outdoor venues and events as it provides a few benefits, namely protecting you and your guests from mother nature - the sun and rain. A tent rental also makes a statement. We offer tent rentals in many different sizes to fit all your guests under the tent during your event. When you talk about parties and party rentals, one of the first discussions centers around music. Depending on your event and entertainment selection - either a DJ, live band, or instrumental music such as the Atkinson Duo you will usually want a dance floor for your guests. The next question is always, how big a dance floor do I need, well you're in luck, because we have actually done a great blog post about dance floor size. It's possible that you may also need to rent a stage for your entertainment also, this will depend on your venue, and event. Meet the team - Missi! Meet the team - Sean! Dance Floor Rental set up for a wedding at Rock Creek. 3 Steps to Dance Floor Rental. What size dance floor do I need? What size dance floor do I need? When you do wedding rentals in Mobile and Pensacola areas, you get a lot of questions regarding wedding planning. This is to be expected as most people don't normally plan elaborate events every day. One of the first questions that we ask our clients is if they have a local wedding planner or event planner that they are already working with. While this is not a necessity it certainly helps to have a partner in this process to help you navigate the wedding and event process. Your wedding planner has established relationships with local vendors, florists, venues etc and with their expertise can usually save you money in the end. One of the areas they can help with is dance floor calculations. Would any discussion about dance floor rentals be complete without a little Justin Timberlake? How many guests are going to attend your event? 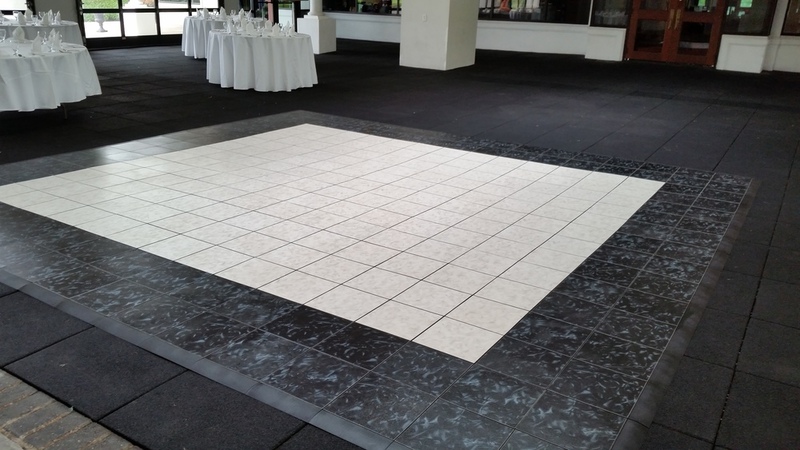 Are there any space constraints at your venue for a Dance Floor? Once you determine how many guests are going to attend and any space constraints, calculating your dance floor size gets a lot easier. Now if your event is going to be outdoors and you want to setup the dance floor on the grass you will need to get a sub floor to help keep the dance floor level, and stable so that it doesn't sink into the grass. We have also loaded the quick dance floor calculator on our tools page here. Please contact us if there are any further questions that we can help you solve with your dance floor or any other setup or rental questions. Please provide any feedback in our comments section below and we are social, click the links below to join the party. Like our Blog? Great! Sign up with your email address to receive weekly updates. Our intent with the SOHO blog is to have fun, be informative, and hopefully shed a little light on party rentals in mobile, pensacola, and the gulf coast. Looking for RENTALS? Click RENTALS on the left to view our inventory.